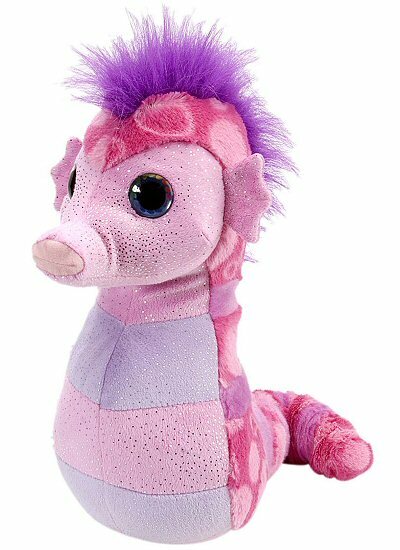 I am a Sweet & Sassy stuffed seahorse and we'll be friends for life, come land or come sea. I have a wonderfully huggable body of soft vibrant pink fabric with pink circles and spots. My light purple stripes are also soft and my pink and lavender face, tummy, and fins are a special glimmer. I have a super fluffy purple mane and my tail curls so fabulously. Just look into my sweet face and you will see a rainbow of hearts in my beautiful blue eyes. And check this out... When you purchase me (aka Sweet & Sassy plush seahorse), a portion of the proceeds helps to provide housing and education for disadvantaged children, as well as protection for abandoned animals throughout the world. It's definitely a win - win - win situation!